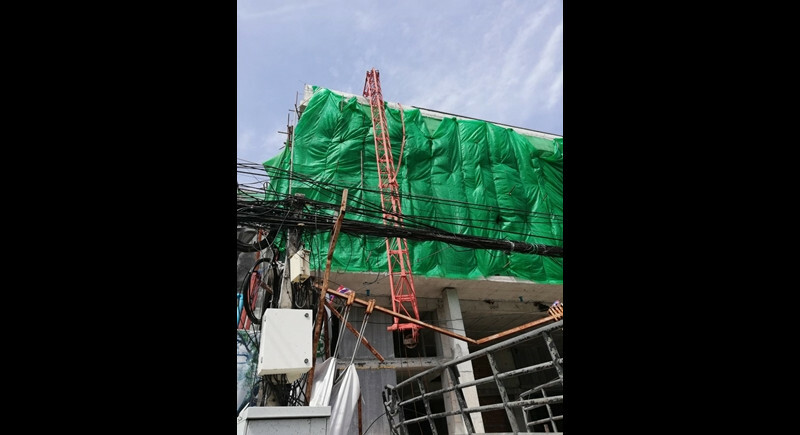 Deputy chief of the Patong Police Lt Col Jetsada Seangsuree was notified that a crane had collapsed at the construction site of the Sensiana Hotel on Phrabaramee Rd in Patong at 10:30am yesterday (July 22). Reports stated that one construction worker has been injured as a result of the collapse. The injured party was taken to Patong Hospital by Kusoldharm rescue workers. However, it was confirmed today (July 23) that the injured construction worker, who police did not name, had been released from hospital care as their injuries were only minor. Lt Col Jetsada told The Phuket News today that the crane collapsed when it was moving concrete slabs. “The weight of the slabs was too much for the crane, this caused it to collapse,” he said. “Police have not yet laid any charges in the case as the investigation is still ongoing,” Lt Col Jetsada added.